Our first Chad Valley Play Panel box arrived safely last week filled with exciting new toys to play with so this week we're bringing to you, our very first review which is of the Chad Valley Designa Friend Doll: Tiffany. 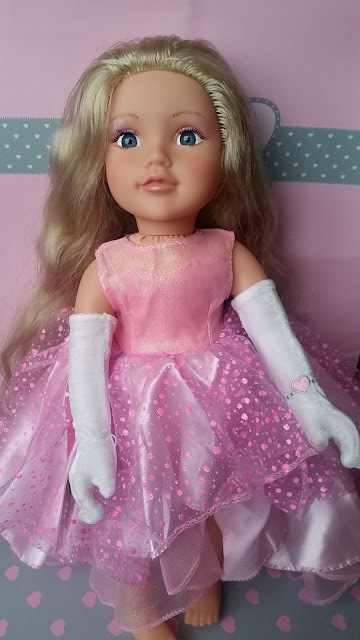 My daughter Lily, who's 9 was so excited when Tiffany arrived in her big pink box as she's already got one Designa Doll (who she loves) and was more than happy to be getting another to add to her collection. Her face lit up as she opened it. Tiffany is a really pretty doll with a hard face, arms and legs but a soft body. She comes wearing a beautiful pink evening gown with sandals, clutch bag, gloves and dangle earrings which can be changed. The box she comes in doubles up as a handy carry case with hanging space (bar included) on one side and a fold-out catwalk on the other side. It's like having your very own model run way with you every where you go. Lily loves her. Tiffany also comes with a spare set of clothes which is a bit more casual. 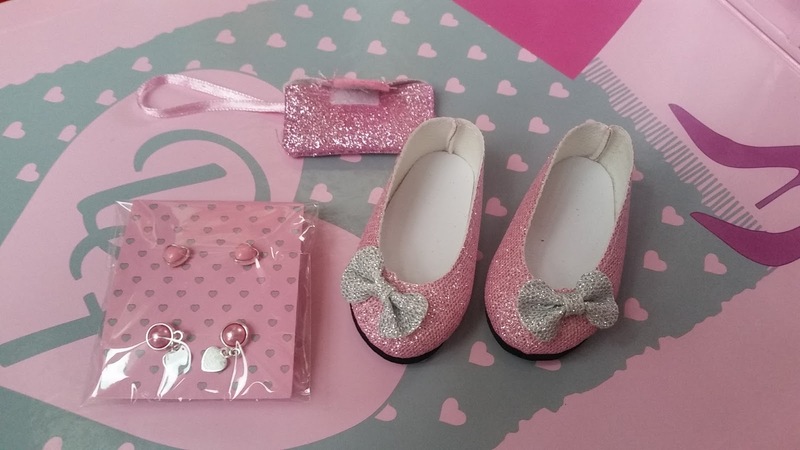 She has a cute T-Shirt, jeans and shoes to change into as well as some extra stud earrings which you can swap and change along with her outfits. 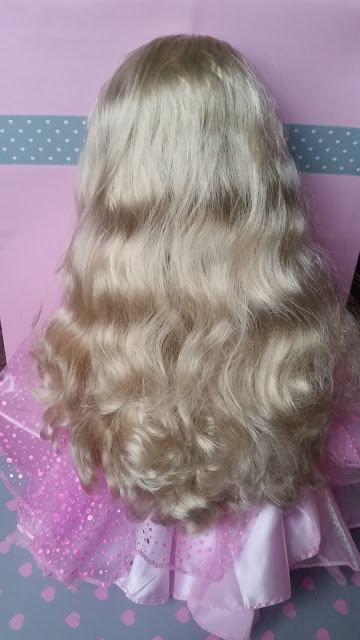 She has lovely long super soft wavy hair which is very pretty but there was a note on her arm saying that only finger brushing was needed as her curls would come out if brushed. Lily wasn't too happy about that as she loves to style her dolls hair but I was a little relieved as it meant Lily wouldn't be messing with her hair too much which often resulted in her dolls getting very matted hair which was 'difficult' to fix. Tiffany comes with a pretty charm bracelet with a heart pendant on for Lily to wear which was a nice little extra. Lily loves the pretty dress that Tiffany's wearing as it's pink and sparkly which are two of her favourite things. She loves the long hair but doesn't like that she can't style it as she'd want. Tiffany's blue eyes and blonde hair is very pretty, Lily has the opposite of brown eyes and brown hair so she often tends to go for the blonde dolls for a change so she was happy with that. I don't think Tiffany has changed out of her dress yet. Lily loves the box because it turns into a Fashion Catwalk for her to play with and loves the carry case feature too as it means she can store her new friend away safely at night away from the hands of her little brother. Overall Lily was really pleased with her Designa Doll Tiffany. She's been sat in her room playing with her for a few hours every day since she arrived. I think I can quite happily say that Lily likes her and she's here to stay for good. 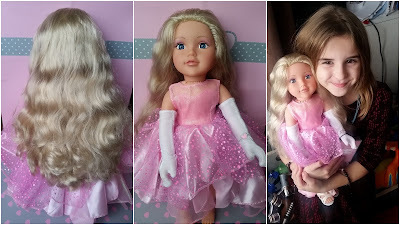 Disclosure: We received our Chad Valley Designa Friend Model Doll Tiffany for free for the purpose of this review but all the opinions expressed within it are 100& our own and honest.